A second show has been added on November 22 as the first one sold out immediately. Ticket link below. North American fans of Jon Lord’s Concerto for Group and Orchestra are in for a special treat this November. 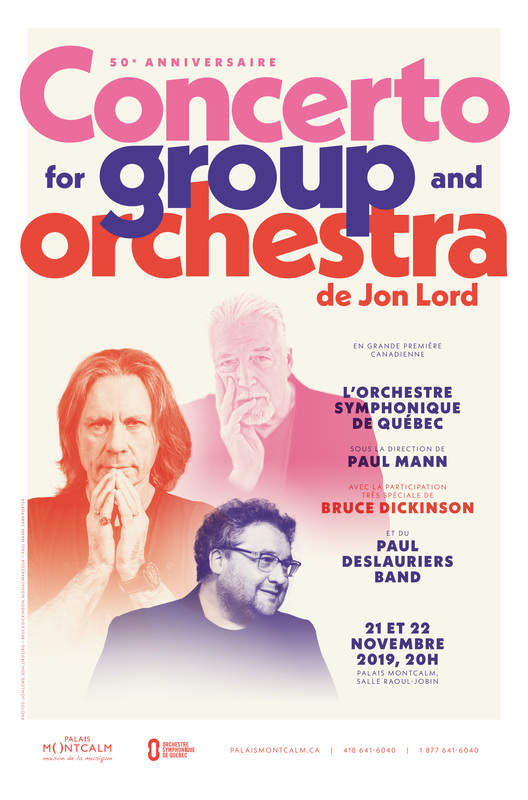 Conducted by Paul Mann and with special guest Bruce Dickinson on vocals, the Orchestre Symphonique de Québec and Paul DesLauriers Band with Pierre Bélisle will perform Jon Lord’s Concerto for Group and Orchestra in Quebec on November 21 and 22. The concert will celebrate the 50th anniversary of the Concerto as well as become its Canadian debut performance. – It’s a great honour to participate in the 50th Anniversary of the Concerto For Group & Orchestra. When Paul Mann contacted me about the Quebec event I said yes immediately. – As many people know, Deep Purple have been a major, ongoing influence in my life since I was a teenager, and down the years I have been fortunate enough to become good friends with all of the band, most especially in my collaborations with Jon Lord. – Right now, I’m still deciding on what to perform – so many great Purple songs to choose from! – and am looking forward to seeing everyone at this very special commemorative evening. – My long collaboration with Jon Lord, and in particular his innovative, genre-defying Concerto, has been one of the greatest joys of my musical life. I look forward to bringing this piece to Canada for the first time on the occasion of its fiftieth anniversary. Jon’s spirit will definitely be with us. Tickets go on sale April 10 through Palais Montcalm.